Wu Yi Cha Wang Da Hong Pao is produced using a special processing technique that was invented in 1985 by the Head of Wu Yi Tea Research and Development Center, Mr Chen De Hua. What is so special about this processing method is that it produces a tea which taste and character is said to closely resemble that of a Da Hong Pao tea prepared from the tea leaves of the original 800 years old tea bush. Even the tea farm (Jiu Qu Xi Pan Wu Yi Shan City Tea Research and Development Center tea farm) is carefully engineered to imitate the environment where the original Da Hong Pao tea bushes grow. This tea comes packaged in a small box with two bags inside - red and brown in color. The tea leaves inside the brown bag were processed using high-fire while the red bag used mid-fire. The tea leaves then were carefully kept for a year (aging) to allow the fire taste to diminish. You will know that this is a special tea as soon as you open the bag. Even the dried tea leaves are very aromatic, and they make many cups of strong tea. 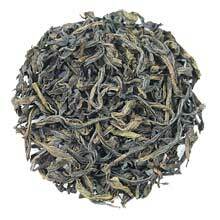 The taste of this tea has a coffee-like quality yet the aftertaste is sweet and lingering fruity notes. Coffee-lovers will love this tea. Dark and slightly curled tea leaves.